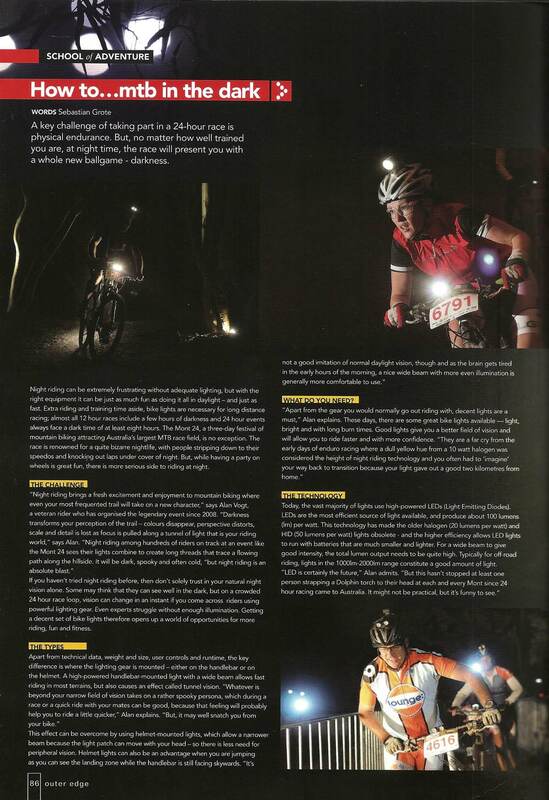 “How to..mtb in the dark.” Outer Edge magazine, Jun-Jul 2011. I was first attracted to the above article for a couple of reasons. Firstly, I thought the chick in the top right corner looked like a bit of a pinner and secondly, having been spoiled by a double set of Radical Lights to race with recently, I was curious to see how other people were describing the night riding experience. Upon reading it I had two conclusions, either the author hadn’t had the chance to ride with a set of Radicals yet, or they didn’t want to raise people’s expectations if they’d just forked out a swag of cash for some lesser beams. Despite the frequent references to tunnel vision and how different the trails look at night compared to in the day mentioned above, night riding doesn’t have to be like that at all. A Podda on the bars and a Chutta on the noggin eliminate both these niggles with a relaxing, edgeless beam, excellent depth perception and trail definition, and the ability to see as far as you need to ride like the wind. While I have become accustomed in recent years to my night laps at 24 hour events being roughly 5-10 minutes slower than my day laps, support from Radical Lights has seen this gap reduce to one minute. Impressive stuff. I also like the way there are inbuilt warning systems for when the batteries have reached 50% capacity, or are nearly drained. Obviously a great option for solo riders who don’t want to leave anything to chance, or to anyone who wants to ride faster than their mates. The other thrill that’s come from riding with Radicals is the way they’ve transformed inner city riding on the road. I wrote about this when I first started using these beams. Cars treat you like other cars, and shoulder tension drops as a result. On road bunch rides I have to lower the brightness down to level one or two out of five so as not to drown out the rest of the group. The joke among Radical users however is that the lights are so bright, it’s not uncommon to get extra fit charging along the road at the front of the bunch as a result. The limiting factor of Radical Lights to most intending users appears to be the cost. They don’t feel they ride enough to justify the cash, or they’re happy to settle for something that requires a bit more compromise to use. The good news here is that, like some other lights on the market now, once purchased, the lights can be upgraded as new technology becomes available. That, and night riding becomes such a pleasure you might just find you’re hitting the trails more after work than you ever did before. Thank you to Radical Lights for the opportunity to use such high end gear. Riding with a crew of similarly enlightened mates at the Mont 24 was definitely one of the highs of the year. Can’t wait to do it all again in 2012!